High quality, durable,shock resistant briefcase style carrying case with individual compartments for each spectacle and plenty of additional room for your other resources. 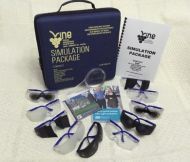 The Simulation Package contains: 10 pairs of Simulation Spectacles (no.s 1-10) as detailed here. The DVD "See What I Mean". Our instruction booklet with suggested training exercises included. A guide on how to correctly guide Visually Impaired persons. A large Magnifier to use with the training exercises.